Champion 4000 Watt Generator Reviewed - the Best Choice for California? Champion 4000 Watt Generator ranks very high among portable generators, offering plenty of significant advantages. While we cannot say it is the absolute number 1 portable generator on the market, having already reserved that honor to the Westinghouse WGen7500, it is certainly a model with a lot in its favor. This is a great choice for use at construction sites, campgrounds and with RVs. It is also reliable and consistent enough to function as a back-up power supply for home and business owners. Many buyers have even used it in the context of Hurricane Sandy and they were not disappointed by its effectiveness. You can run all manner of appliances from the Champion’s three outlets. Lights, televisions, air conditioners, sump pumps, power tools and more. This generator is reasonably fuel efficient. It delivers up to 4,000 Watts of power and is very convenient to start up. The frame, handle, and wheels also make it fairly easy to move and maneuver for such a large generator. The peak power output is rated at 4000 Watts while the steady and reliable output gets a rating of 3500 Watts. The engine is a Champion 196cc OHV that is encased in a cast iron sleeve. The dimensions (length/width/height), are respectively 29/21/21 inches. The total weight is 140 lbs. This is inclusive of the metal framing and two 8″ wheels used to make the generator portable. This generator is compliant with EPA carburetor standards as well as all environmental rules that apply in the state of California. The generator comes with a wireless start-up remote that works from a distance of up to 80 feet. The remote runs on a battery which is included in the set. There are three distinct types of outlet on this generator: a 120-volt duplex outlet, a 120-volt twist-lock and an RV receptacle. The unit comes with overload protection, a low-oil sensor, and an Intelli-gauge apparatus that gives you at-a-glance information on voltage, hertz and operating hours. The gas tank holds 3.8 gallons and is capable of running for 12 hours at 50% load. This comes out to about one-third of a gallon of gas used per hour. The ability to start up the engine from a distance using a remote is a major convenience. A back-up plan for getting the engine going in the form of a pull-start lever is a smart addition. In other words if the electric start-up battery were to go dead, you could still use the machine. There is no need to unplug your appliances before re-starting the generator because of a 20-second power delay. The power also cuts off a few seconds before the engine stops, providing added protection. 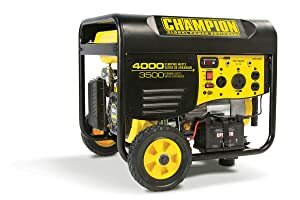 Although no portable generator should be run in the pouring rain, the high water-resistance levels of the Champion 46539 4000 watt generator will stand up to light mist as good as all Champion generators we have reviewed and other models on the market. The noise level is quite low given the relatively high wattage of this generator. The engine runs relatively smooth and quiet. The CARB compliance is one of the most crucial features of the generator distinguishing it from some of its competitors. It allows it to be used across all 50 states, including even “CARB-conscious” California, without any risk of being fined by the EPA. There is no 240-volt outlet which may be an issue to some users. When CARB-compliance becomes a major issue (especially for the residents of California), the Champion is one of the best generators available on the market. A final factor to consider that enhances the appeal of the Champion is the two-year limited warranty and lifetime free tech support that it comes with. Ease of assembly, online manual, and inclusion of engine oil and remote battery with initial purchase also tip the balance in the Champion 46539’s direction.